Note: This article was first published in November, 2001. Many principals love to share their love of reading with the students in their schools. When principals read aloud their favorite books to students, they are modeling a love of reading. Reading aloud, principals say, lets students see the principal in a different light too. Education World asked our Principal Files Principals to share with us their favorite books to read aloud to students. Today, we're pleased to share their responses with you. Perhaps you'll find a new favorite book to share with kids as a result! GET THE SCHOOL YEAR OFF TO A GOOD START! * How Many Days to America? Click here for more about each of these titles. "I like to read to our students early in the school year," principal Jim Clark told Education World. "Doing so helps students understand the importance of reading for enjoyment." Clark always makes time to read at least one book to each class at T. R. Simmons Elementary School (Jasper, Alabama) during the first month of the school year. One of Clark's favorite read-aloud books is Koala Lou, by Mem Fox. "I really enjoy the story because it sends the same message that I want to convey to my students. The message is that no matter how busy I might be each day, I love them and want each of them to do their best." Another favorite of Clark's is The Summer of the Bonepile Monster, by Aileen Kilgore Henderson. "This book usually keeps students in grades two to five sitting on the edges of their seats. The story entertains as a mystery unravels." "As a teacher, reading aloud to my kids was my favorite activity," Bridget Sullivan, principal at Warren (Massachusetts) Community Elementary School, told Education World. "Not only was it satisfying to read an engrossing story, but it was wonderful to see those open-mouthed faces as they listened intently." Sullivan has a number of read-aloud favorites, but her all-time favorite is Where the Red Fern Grows, by Wilson Rawls. "Another book I love is Huge Harold, by Bill Peet," said Sullivan. Appropriate for students in grades one to three, Huge Harold is a story about the oddity of a rabbit that grows huge. "People's reactions, intolerance, and genuine goodness are addressed in a rhyming, friendly, non-preachy way," Sullivan said. "Children are usually able to finish each couplet as you read, which makes reading this book an interactive experience as well!" Reading aloud can help students feel more comfortable sharing and confiding with the school principal, said Yolanda Ramirez. Ramirez, principal at Zavala Elementary School (McAllen, Texas), told Education World, "I want students to feel comfortable with me so they come to me with their questions and concerns. I want them to know that they can count on me." That's why Ramirez often shares with her students the story of The Velveteen Rabbit: Or How Toys Become Real. This classic by author Margery Williams has inspired many wonderful discussions with students about truthfulness and trust, said Ramirez. The story gives Ramirez an opportunity to share some of her thoughts, feelings, and experiences as they relate to trust and truthfulness too. "In order to provide an environment of support and trust, we must take a few risks, share a part of ourselves," she told Education World. "When we share, it is much easier for our students to feel safe to do the same." "The rewards are worth the risks," added Ramirez, who has a collection of three dozen different printings of The Velveteen Rabbit as well as related plush toys, videos, an LP album, and more! "Books that taught character were among my favorite stories as a youngster, and as a principal, I have enjoyed reading them to the students," said Barbara Woods, an administrator in the schools of Lewisburg, Tennessee. "My father used to read to me from a book called Stories That Never Grow Old. All the stories had a lesson. I love to read those stories to students and, since the stories are 'old' many have never been heard by the students." "My favorite story to read to kids is The Giving Tree, by Shel Silverstein," said principal Lucie Boyadjian of Glen Oaks School (Hickory Hills, Illinois). "It is short enough so I can make it to all 23 classrooms and enjoy the moment, and it's powerful enough that the students respond to it in some way. It makes the kids think while it touches their hearts. "Since many of us are trying to incorporate some kind of character education into our schools, I find this book a good way to get kids to think about absolute love, unconditional generosity that is not always reciprocated, and friendship," added Boyadjian. HOOKED ON THE JOY OF READING! Norma Chenevert has taught all the grades and is now the principal at Pittsburg (New Hampshire) School, a K-12 school. When we asked her about her favorite read-aloud, she said, "I keep coming back to Tales of a Fourth-Grade Nothing, by Judy Blume. I have read it to many age levels, including adolescent males. It lends itself to the reader 'hamming it up' quite nicely. And any child who has younger siblings can easily relate to it." "Students enjoy being read to at any age, particularly by somebody who is able to make the stories come alive," said Chenevert, who even enjoys reading fairy tales to older students and discussing why they might have been written. 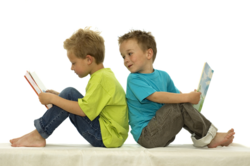 "If we share the love of reading with our students, we can hook them on its joy!" added Chenevert. Our P-Files principals shared many other favorites, including those that follow below. Click here for a bibliography that includes more information about each of the following titles and those mentioned in the story above. Ira Sleeps Over, by Bernard Waber, is a favorite of principal Betty Peltier of Southdown Elementary School (Houma, Louisiana). "I bring my own teddy bear with me and the students get to bear-sit him and the book for a few days after I read the book aloud," she added. Love You Forever, by Robert Munsch, and Miss Rumphius, by Barbara Cooney, "are both 'cycle of life' stories that speak to the importance of legacy building and the power of modeling to our students," said former principal Susan McGuire. Leo the Late Bloomer, by Robert Kraus, is an excellent read-aloud book for teaching about individual differences and honoring each child, said Karen Linden, principal at Oliver School (Edmonton, Alberta, Canada). Oh, the Places You'll Go! by Dr. Seuss, is a favorite of Lolli Haws, principal at Avery Elementary School (Webster Groves, Missouri). It offers "a message of hope and positive thinking about making choices in life and being responsible for who one turns out to be," Haws told Education World. "I'm drawn to the book for its meaning on an adult level -- reassurance that we choose our lives and outcomes, and on a child's level -- hope for all the great things you're about to experience. Even with bumps along the road, you'll get there." The People Who Hugged the Trees, by Deborah Lee Rose, "is a wonderful multi-cultural book that demonstrates graphically how much difference one person can make," said Julie Ryan, principal at The American School in London. Ryan's other favorites include Allen Say's book Grandfather's Journey, Eve Bunting's How Many Days to America? and Mem Fox's Whoever You Are. Bedtime Stories by Thornton W. Burgess "are old and unknown to the children," said principal Brian Hazeltine of Airdrie Koininia Christian School in Airdire, Alberta (Canada), "but the characters are loveable, and there is always a character-building theme." The Witches, by Roald Dahl "is full of wonderful language and just scary enough to have kids hanging on the ends of their seats," said Julie Askew, acting principal at Eltham Primary School in Melbourne, Australia. "It also appeals to both girls and boys, including the naughty ones."